Reworking Poppy was a chance to tune up her biggest, baddest character elements while giving her completely new play patterns. We knew the hammer, her signature weapon, would be critical in solidifying her refreshed identity; like Jinx’s rocket launcher, Nautilus’ anchor, or Riven’s sword, Poppy’s hammer is an integral part of both her kit and her personality. We had to get it right for both to ring true. In short, it was hammer time. Poppy’s new champion-smasher wasn’t custom-made to fit her; it’s a regular-sized hammer she wields with incredible power. “The new hammer is more than a weapon,” Gem says. “Its humongous size contributes to her silhouette and her movement. No champion moves like her. 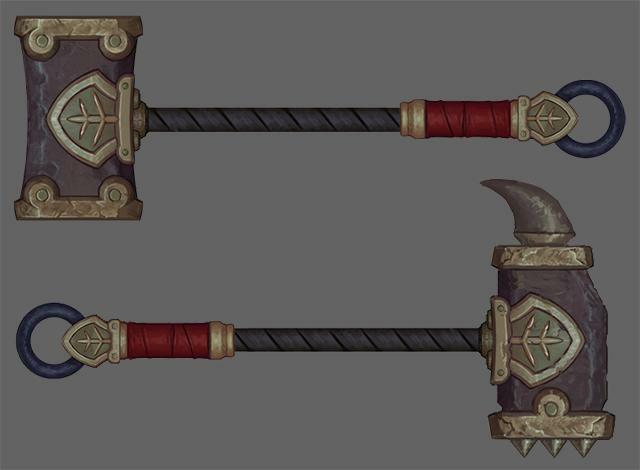 When you see her swing that hammer, it’s so different from Sion with his axe or Garen with his sword.” Senior narrative writer John O’Bryan adds, “It’s almost like she puts all of herself into every swing.” The new hammer design contributed to Poppy’s new ult and each of her re-tuned abilities. When others run away, Poppy runs forward. She’s indomitable. Poppy’s hammer is an important part of her personal journey. “A Hero’s Call,” which offers players a glimpse into Poppy’s world, is centered on the hammer and what it means to her. O’Bryan elaborates, “Even she doesn’t think it’s hers. She thinks it’s a tool for someone else.” Scaling the hammer to make it a normal hammer size helps emphasise the idea that Poppy doesn’t necessarily believe the hammer is hers to wield, that somewhere in the world is a hero meant to carry it. The hammer existed long before Poppy took possession of it. Though she’s been carrying the hammer for a long, long time, Poppy hasn’t yet realized that she’s what gives the hammer its strength. O’Bryan explains, “If you were to ask Poppy, she would probably think she’s nothing special. Everything she’s doing is because of this hammer she’s carrying around. But really, it’s all coming from her.” Players know one thing Poppy doesn’t: The hammer is right where it needs to be.